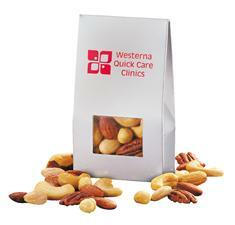 Indulge your customers and employees with these "junior-sized" silver treat boxes packaged with two ounces of fresh roasted Deluxed Mixed Nuts. Gift box is foil-stamped with your logo. Imprint Area: 1-1/4" x 2"